The Online watercolor course is designed for beginners and improving artists who want to develop their watercolour skills and techniques while working at their own leisure. The watercolour course is an unique home study course consisting of six individual projects each with personal feedback and many helpful suggestions on improving and painting with confidence in watercolour. Each project builds up in easy pictorial stages. Clear and informative photographs and instructions for you to work through in your own time. Explaining everything you need to know to paint a watercolour landscape painting. With personal feedback on each of the six projects. 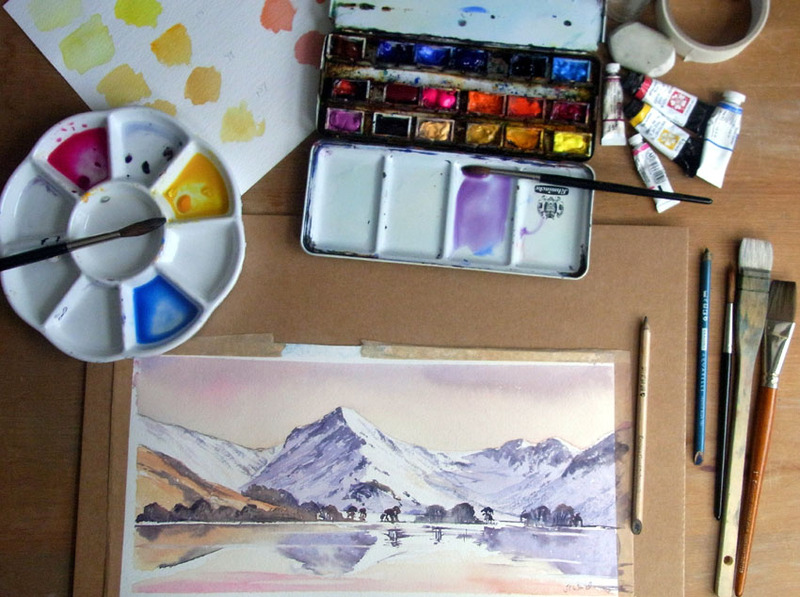 Based in the Lake District Jane paints regularly outdoors, with many of the subjects on the course been famous Lakeland scenes for you to follow and you will be impressed at what you will achieve. You will learn many new tips including how to capture atmosphere in a landscape scene, Colour mixing, transparent washes, tonal values, easy and successful ways to paint skies, lakes and trees. These are just some of the techniques included and many secret watercolour tips, with lots of personal feedback. Each Course includes six projects with individual sketches, colour tags, a materials list and step by step demonstration with plenty of photographs and handy tips and personal feedback with each project. An ideal course to start watercolour painting with step by step guidelines, easy techniques, materials explained and personal feedback. Each Course includes six projects with individual sketches, colour tags, a materials list and step by step demonstration with plenty of photographs and handy tips and personal feedback with each project. The cost of Online Watercolour One course is £55.00 for six individual projects. This is the ideal course for someone who would like to start watercolour painting and not really sure where to begin. An Ideal Christmas present for the aspiring Artist. The Gift voucher includes the course details, sketches, colour tags and a personalised signed print card. Course Two leads on from the beginners course with six challenging projects including masking, Winter landscapes and techniques for woodland Bluebells and Trees. Personal feedback with each project and helpful hints to improve your painting skills. The cost of Online Watercolour Two course is £55.00 for six individual projects. Couse Two leads on with many more Landscape challenging scenes, with step by step guidelines, many techniques, materials explained and personal feedback. Each Course includes six projects with individual sketches, colour tags, a materials list and step by step demonstration with plenty of photographs and handy tips and personal feedback with each project. Course Three is ideal for the Intermediate Artist with six challenging colourful projects including Alpine views, Italian Lakes and French Doorways to name a few. With personal feedback and helpful hints to improve your painting skills. The cost of Online Watercolour course Three is £55.00 for six individual projects. Couse Three leads on with many more Colourful Landscape challenging scenes from the Alps to Italy , an ideal course for anyone painting abroad. Each project comes with step by step guidelines, many techniques, materials explained and personal feedback. Each Course includes six projects with individual sketches, colour tags, a materials list and step by step demonstration with plenty of photographs and handy tips and personal feedback with each project. Personalised gift vouchers available with a signed print card an ideal present for the budding artist. I loved the effect of the drops of water on the trees and felt more confident in handling the paint. “I wish someone had told me these tips earlier, the course has been a real insight into watercolour” Steve, Newcastle. ‘I am looking forward to doing a third correspondance course with you. I feel I’ve gained so much from the last two, and now have a folder full of very useful tips and information that I can always refer to.’ Jenny from Surrey. I’ve been in a state of mild panic for quite a bit of this task but at the end, although I know where the panic bits are and tend to focus on my mistakes, I’m amazed at the finished painting! I’m well out of my comfort zone but I do feel I’ve learnt such a lot! And it really is this easy , enjoyable and addictive.